SpiritGrass is a unique collaboration between the renowned jazz and bluegrass artist Eric Miller and world instrument troubadour Clint Goss. Eric and Clint connected at a chance “in the moment” improvisation at a performance in the summer of 2005. They combined Mandolin with a Slovakian Koncovka flute. The music that emerged, as well as the standing ovation, told them that they were on to something. They began exploring combinations of instruments and motifs, expanding progressive bluegrass in new directions. 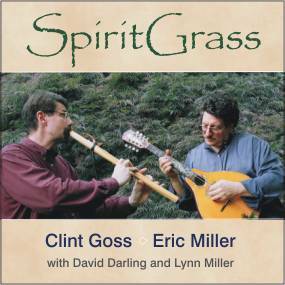 The SpiritGrass CD is a fusion of progressive bluegrass styles with world music. It draws on Eric's ripping mandolin, mandola, guitar, and electric bass work combined with Clint's skill on an expansive array of instruments including African Tongue Drums, Udus, Kalimbas, Swiss Hangs, Indian Tamboura, and flutes from Native American, African, Hawaiian, Middle Eastern, and Eastern European cultures. The feel ranges from melodic and meditative to upbeat and foot-stomping.